“You know what makes me laugh?” said the Joker to the thief. “Oh, do tell, my fiendish friend,” said the thief, as he packed the stolen package that had been stolen from him by The Joker, then sold back to him, into his own backpack. The eponymous villain of Gotham City fame sat slouched on a sofa in the fancy plush penthouse hideout of the Platinum City heist man known as Fiasco. Outside, the sun was setting, casting a purplish hue across the sky. Inside, the two wiry madmen were finalizing their business, which involved the rare and very powerful substance, psytanium. Uproariously obnoxious laughter bellowed from the two men who were now riffing effortlessly. It was like they’d known each other their whole lives, although they’d only met just a few days earlier. Both men stopped to think… for a long time. Joker rubbed his chin in deep thought, as Fiasco literally scratched his head. “What?” said Fiasco with a puzzled look across his brow. “You know, like ‘fridging?’ Oh, I forgot you’re still new to this,” The Joker said, oozing condescension. “Fridging happens to the ladies of all the greatest comic book heroes. It’s when bad guys, like you and me–” He’s cut off. “You and I,” Fiasco corrected. “We should totally change that!” Fiasco announced with unbridled glee! “Ha-HA! Who will be our first target?” said Fiasco as he pulled out his cellphone, which was adorned with a ‘Batman v Superman: Dawn of Justice’ decal. “Who’s Black Widow dating right now?” asked the Joker. “True dat! What about Wonder Woman? “Naw, she’s currently flying solo.” Said the Joker. “What?” But just as Fiasco realized what was about to happen, it had already happened! The Joker had gone in his pocket and unleashed an array of Joker-branded bombs! The thief was forced to take cover as a plethora of explosions filled the penthouse with sparks and smoke. “You must think life is but one big joke,” snickered Fiasco from within the smoke. A split second later a pair of Fiasco-branded socks emanated from the smoke as well. But they weren’t just ordinary socks; they were laced with an adhesive gel that caused them to stick to the door of the safe. The adhesive gel was also a conductor for the electromagnetic devices tucked in near the toe of each piece of footwear. The Joker shook out the cobwebs, collected the bag containing the psytanium and rolled to his feet. “Well played, my acrimonious acquaintance! But I’ve gotta say, I’m tired of coming up with quotable quips and clever carnage to cast your way. 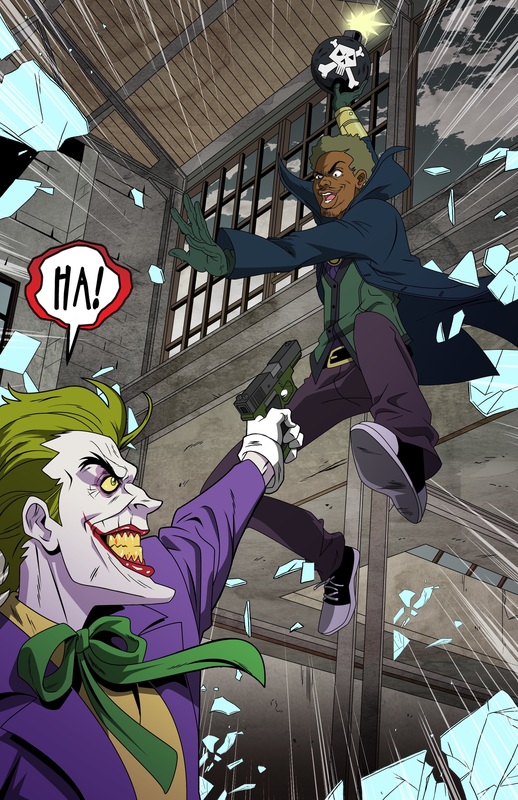 How about we make it simple and I just shoot you?” A split-second later the Joker pulled out a handgun and opened fire. The Joker let off a few more rounds, then headed for the door. He hit the hallway in a dead sprint, rounded the corner and found the elevator. He smashed the down button a half dozen times. He waited. “Arrgh! Forget this!” he screamed in frustration. He pulled out his laser cutter and cut open the elevator doors, revealing the shaft. He leapt into the shaft, grabbed the cables and slid like a firefighter on a pole all the way down to the underground garage, where his pimped-out Joker-branded Lamborghini Diablo was waiting. The dastardly dapper deviant ran for his ride. But just as he was about to grab the driver side door handle, the entire car exploded! The impact sent him flying backwards! Then CRASH, Fiasco burst through one of the upper level glass panes with a comically cliché bomb in his hand. 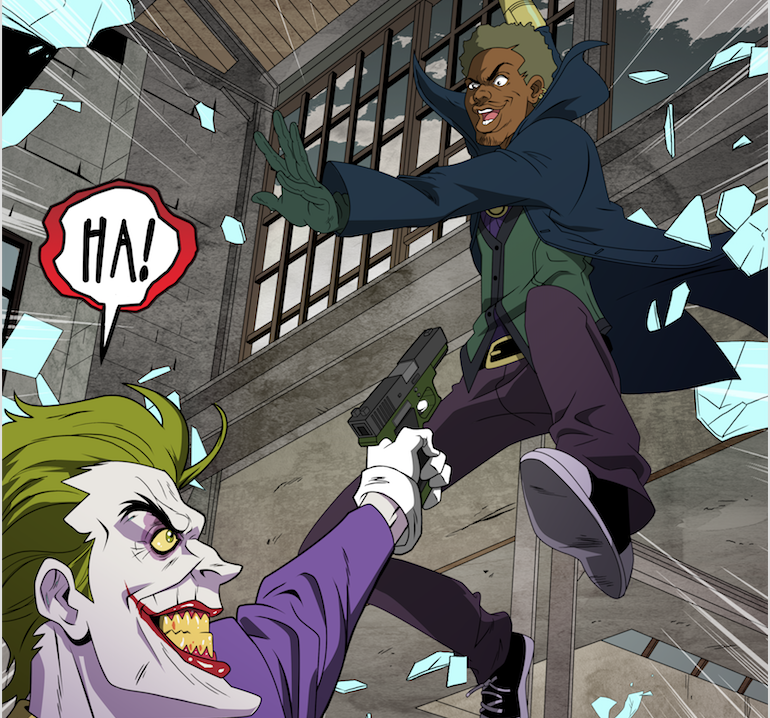 The Joker recovered, brandished his firearm and fired just as Fiasco let the bomb fly! KABOOM! The explosion rocked the entire structure and ruined at least a dozen other high-end vehicles. “I have such an explosive personality, wouldn’t you say, Mr. J?” Fiasco said with a smirk on his lips. The Joker took aim and pulled the trigger. CLICK! He was empty. “No, it’s impossible!” Fiasco shouted. The two men stared at each other for an intense moment. You could cut the tension with a butter knife. It was Fiasco who broke first… as in broke out in laughter! Fiasco continued to laugh, and after a few moments, the Joker began laughing, too! Before long, they were both hooting outrageously, slapping their knees, holding their bellies, almost rolling on the floor laughing their butts off. It was nearly 2 whole minutes before they began to compose themselves. Fiasco found the composure to speak. “It’s pretty crazy we find ourselves here, but you know, you and I, we’ve been through a lot, and this, my friend, is not our fate. So, let’s stop talking falsely, the hour’s indeed getting late.” And with that lyric of the Jimi Hendrix classic, Fiasco hit a button on his wristband causing a pillar near the Joker to explode! The Joker leapt for cover then hit a button on his own wristband igniting yet another blast! For the next several minutes the two scandalous scoundrels traded explosions, the Joker attempting to find an opening to escape while Fiasco looked for the perfect opportunity to box in his adversary. With every discharge, the parking structure weakened, meaning the 33-story building’s foundation was also faltering. And by the time they realized what was happening, it was too late. The skyscraper buckled under the pressure of the detonations! Fiasco and the Joker ran for their lives but were not able to reach the exits before tons of rubble and debris came crashing down! Within minutes emergency crews were on the scene. Police officers, fire and rescue and even a few superheroes had arrived to begin the process of digging out survivors and cleaning up yet another disaster caused by villainous activity. Down the street, a manhole cover popped open and the Joker climbed out. He looked upon the carnage with unbridled glee. “Haha-ouch!” A brick up-side his head had caused him to stumble forward, forcing him to drop the backpack. A moment later, Fiasco snatched up the bag and threw it over his shoulder. “Gotcha! Hahaha!” Fiasco chuckled, as the two men faced each other. “Soooo… no hard feelings?” The Joker asked. Just then the sound of a police siren ruined the moment. The two men bid each other adieu and scurried out of sight.